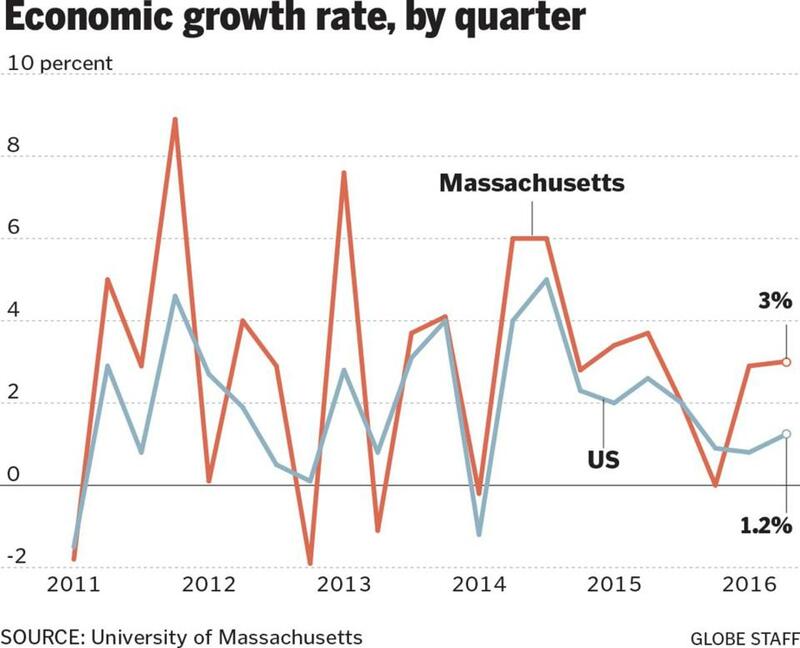 The Massachusetts economy kept steady in the second quarter of the year, despite lagging consumer spending, slowing growth elsewhere in the world, and the UK’s decision to leave the European Union, the University of Massachusetts reported Friday. The state’s economy grew at an annual rate of 3 percent, a notch better than the 2.9 percent expansion in the first three months of the year. Bolstered by still healthy economic sectors, such as health care, education, technology, and professional services, Massachusetts continues to outperform the nation, according to the report, published in the UMass economic journal, MassBenchmarks. Massachusetts employers continued to add more jobs, with unemployment at 4.2 percent, the lowest level in 15 years. The state’s workers are also seeing their incomes rise, with wages and salary up 3.7 percent from the second quarter of 2015 as the labor market tightens and companies offer more money to hire and retain employees. “We’ve had moderate growth,” said Alan Clayton-Matthews, a senior contributing editor of MassBenchmarks and a Northeastern University economics professor. However, the national outlook was more sobering. The US Commerce Department reported Friday that the national economy grew at a disappointing annualized rate of 1.2 percent during the second quarter of this year, compared to 2.6 percent during the same period last year. That follows an even more tepid performance during the first quarter when the US economy grew at a mere 0.8 percent. The sharp slowdown in recent months is likely to raise worries that the recovery may be losing steam. “It’s still challenging times out there in the economy,” said Sam Bullard, a senior economist at Wells Fargo & Co. In the second quarter, businesses in particular pulled back dramatically in the face of continued global uncertainty and weakness in the energy sector. Businesses shrank their inventories and investments by nearly 10 percent. By contrast US consumers were more confident in the economy, increasing their spending by 4.2 percent. In Massachusetts, consumer spending improved slightly from the first quarter, growing by 0.8 percent. During the first three months of this year, Massachusetts consumers cut their spending by 6.1 percent, according to MassBenchmarks. A decline is automobile sales is dragging down consumer spending in Massachusetts, Clayton-Matthews said. Clayton-Matthews said he expects the state’s economy will slow slightly through the rest of the year, expanding at 2.9 percent in the third quarter and 2.2 percent at the end of the year. Slower growth in China, a wave of baby boomers retiring from the labor force, and uncertainty about the upcoming presidential election will likely continue to dampen economic growth and business confidence, according to MassBenchmarks.